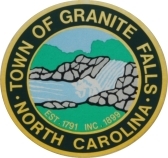 Established in 1899, Granite Falls is situated in southern Caldwell County located partly on Lake Hickory and less than five miles from US 40 and Hickory. Granite Falls has benefited from a residential spillover from Hickory and nearby Catawba County and has also enjoyed a boom in commercial growth along US 321. Granite Falls is also home to the world’s largest collection of soda pop memorabilia housed in Antique Vending Company’s showroom, and the town is home to the second oldest home in Caldwell County, which the town has converted into the Granite Falls History and Transportation Museum. Visitors to downtown Granite Falls will find a large slab of granite rock and town clock flanked by locally-owned shops and unique architecture. Granite Falls operates the William B Shuford Recreation Center, which provides a variety of fitness and youth activities.